Do you suffer from excessive armpit sweat? MiraDry is the solution. MiraDry utilizes microwave technology to permanently deactivate sweat glands. 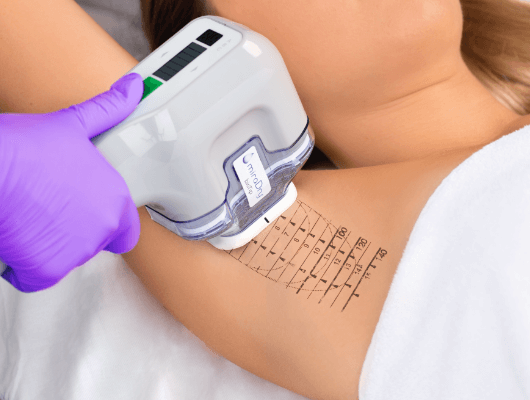 With a single one hour MiraDry treatment, excessive sweat can be permanently eliminated with the average patient experiencing an 82% reduction in sweat after one treatment. MiraDry also drastically reduces odor and armpit hair. The treatment is completely non-invasive, has minimal recovery time, and is 100% permanent. In one hour, you can be sweat free, forever. Many of our staff members have had miraDry and can answer any questions you have about the procedure. For more information on miraDry, please give us a call at 513 469-0300. A small subset of patients require two treatments. If you are not happy with your results after the first treatment, a second treatment is offered at a substantial discount.